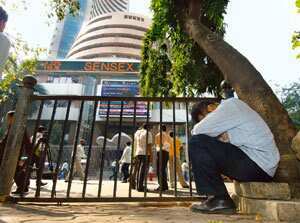 Mumbai: India’s bellwether stock index, the Bombay Stock Exchange’s (BSE) Sensex, plunged below 7,700 in mid-day trades on Monday, a level last seen in August 2005, but regained 800 points to close at 8,509.56—a 2.2% loss—after domestic institutions went bargain hunting. According to provisional data from BSE, local institutions bought stocks worth Rs916.18 crore on Monday even as foreign institutional investors (FIIs) sold Rs1,027.30 crore worth of stocks in the cash market. The large-scale FII pull-out from equities continued to put pressure on the local currency, pushing the rupee down to a new lifetime low of 50.29 to a dollar in intra-day trade, but aggressive dollar selling by the Reserve Bank of India (RBI) stopped it yet again from closing above the 50-mark. The rupee closed at 49.87/88, stronger than its previous close of 49.95/97 a dollar after an estimated $1.5 billion (Rs7,515 crore) sale by RBI. So far this year, the rupee has slid more than 21% against the dollar. At Monday’s low, the Sensex was down at least 62% since the beginning of this year. Its close of 8,509.56, however, was 58% lower than the index level at the beginning of the year. While the Sensex has lost less than the Shanghai SE Composite Index and Hang Seng index thus far this year, it has lost more than many other Asian markets, including Japan, Thailand, Singapore, Taiwan, the Philippines and Malaysia. In the US, the Dow Jones Industrial Average was marginally down in early trades. It was down 11 points at 8,367.72 at about 8.30pm India time. With continuing free fall in stock valuations, investors, both global and local, are waiting for governments and central banks to unveil new measures to support equity markets and corporate earnings. At least 40% of Indian firms that have declared results for the quarter ended September have posted lower net profit compared with the corresponding quarter last year on account of higher input costs and lower sales. RBI has cut its policy rate and released Rs1 trillion into the banking system by paring banks’ cash reserve ratio (CRR), or the portion of deposits that commercial banks need to keep with the central bank, but these measures have not helped restore confidence. “The only solution is that interest rates must be dropped dramatically," said Jon Thorn, chief executive officer, India Capital Management Inc., an India-dedicated FII, in a telephone interview from Hong Kong. “Globally, policies have been focused on providing money to banks but now steps should be taken to decrease borrowing cost for companies and other institutions. The value of holding money must be decreased to such extent that capital in cash really becomes unattractive." Many global analysts and economists, including David A. Rosenberg, North American economist for Merrill Lynch, are betting on a sharp rate cut by the Federal Open Market Committee, the policy-making arm of the US central bank, which is meeting this week. “It is time to worry about... the lack of inflation. We are looking at 50 basis points cut (in interest rates)," Rosenberg said in his latest report. Shah’s recommendation: The government should consider setting up a market stabilization fund, much like Hong Kong has done; it should also lift the equity exposure limit for local insurance companies and banks; it should allow local pension funds to invest in equities; and it should announce tax-soaps on equity investments that will encourage retail investors to put money in the markets. “The current value of FII holding in Indian equities will be around $50-60 billion. These measures could support markets as FIIs continue to sell," Shah said. FIIs have so far taken out at least $12.2 billion worth of Indian stocks this year, net of purchases, after pumping in about $67 billion net of sales between 1993 and 2007. But for the domestic institutions’ support, which bought Rs67,537.96 crore (about $13.5 billion) worth of stocks this year, the Sensex would have seen a sharper fall. Not all FIIs are, however, scrambling to exit India at any cost. According to Thorn, “Indian stocks are trading too cheap and are very attractive. It is completely irrational, based on fear and uncertainty. Now nobody wants to buy anything at any price." The price to earnings (P-E) multiple of Sensex stocks has come down from 27.67 in January to 10.36 now. The P-E, the most popular metric of stock analysis, looks at the relationship between the stock price and a company’s earnings. The higher the P-E, the more the market is willing to pay for a company’s earnings. But at the same time, a high P-E could be an indication that a stock is overpriced. Conversely, a low P-E indicates lack of confidence of investors in a stock, but it can also encourage them to buy the stock as it is not overly priced. The Shanghai index’s P-E continues to be the highest among Asian markets at 14.04, but it is almost one-fourth of its level seen in January. Long-term measures, which the Indian government could take to accelerate economic growth and revive the markets, according to ICICI Prudential’s Shah, could be “slashing down interest rates, as well as quick sanctioning of corporate projects". Indranil Sengupta, India economist for Merrill Lynch, also said the government may push for growth. “We expect Delhi to push government banks for a 25-50 basis points prime lending rate (PLR) cut on the back of aggressive monetary easing, even if it means taking a calculated risk against inflation," Sengupta said. One basis point is one-hundredth of a percentage point. Nandan Chakraborty, head of equity research, and Sachchidanand Shukla, economist, at local brokerage Enam Securities Pvt. Ltd, in their latest India strategy report, said the Sensex would trade at 15,109 in November 2009. According to the report, in the first quarter of calender year 2009, insurance firms will purchase $5 billion worth of stocks and the market will move from severe undervaluation to a stress-case valuation level (8,000-12,000). In mid-2009, an invigorating new government and global macro realignments will bring in the “West to East" theme into sharper focus, the report said. Further explaining this macro shift, the report calls for MSCI re-balancing. “Despite representing 24% of world GDP, Chindia (China and India) and South Korea’s MSCI World Index weight was below 5%, while the US enjoyed 42% muscle with 19% of GDP. Will this not change as economic purging plays out fully and Chindia emerge as largest global growth contributors?" The Morgan Stanley Capital International or MSCI Index is designed to measure equity market performance in global emerging markets.